In the summer, my husband and I move to our cottage on the great prairie ocean. In order to spend lots of time there we need an office from which to do our daily business in the outside world. 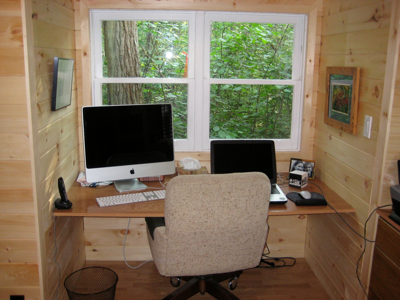 We renovated a 50 year old 8 x 9 ft shed into a pine scented oasis, replete with laminate floor and big windows to look out into our bird land. Imagine how wonderful, while trying to solve a difficult programming issue, to look out and see a squirrel trying to solve a navigation problem to find his way to the birdfeeder. This re-designing of a room is part of designing our lives according to the principles of Sarah Susanka’s Not So Big Life: Making Room for what Really Matters. http://www.notsobiglife.com/ So we made room. This entry was posted in Uncategorized and tagged office on July 5, 2008 by nurturingspace.